Last week I picked the last of my garden’s peppers. They were green with yellow stripes because they are no longer able to mature into the color yellow or the red that usually marks the various stages of maturation. I thought I’d combine them with whole grain spaghetti. Bring a pot of water up to a boil with salt for the pasta. Clean the peppers, removing the stem, seeds, and white lining, then cut them into thin strips. Pour the oil, garlic, thinly sliced shallots, peppers in a pan and cook over high heat, stirring frequently. After ten minutes, pour in the white wine and let it evaporate. Continue cooking for another ten minutes then add salt. When they become tender, turn off the burner. The water should be boiling at this point. Pour the spaghetti and cook according to the instructions on the package. 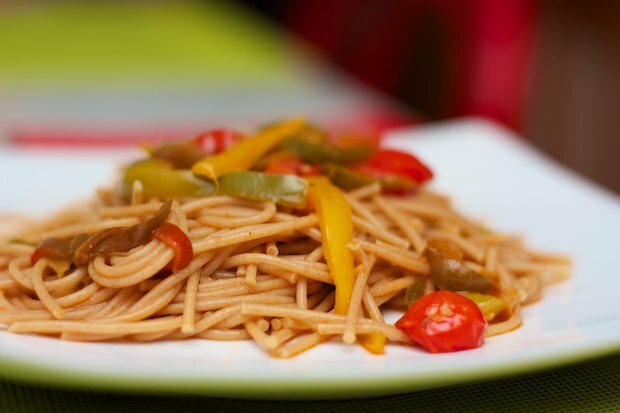 Drain the water from the pasta and pour a ladle of the cooking water on the pepper sauce along with sweet paprika. Drain the pasta and pour it into the pan with the sauce, heat for a minute. Serve on individual plates with a sprinkling of parmesan cheese. 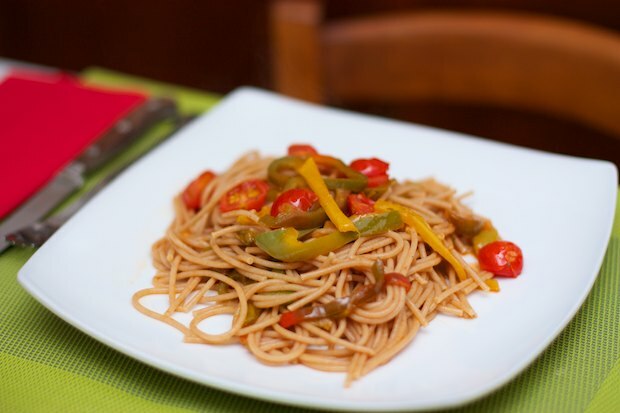 Posted in Pasta and tagged with Spaghetti Integrale ai Peperoni Verdi, Whole Grain Spaghetti with Green Peppers. RSS 2.0 feed.